Why Did NJA Shut Down? 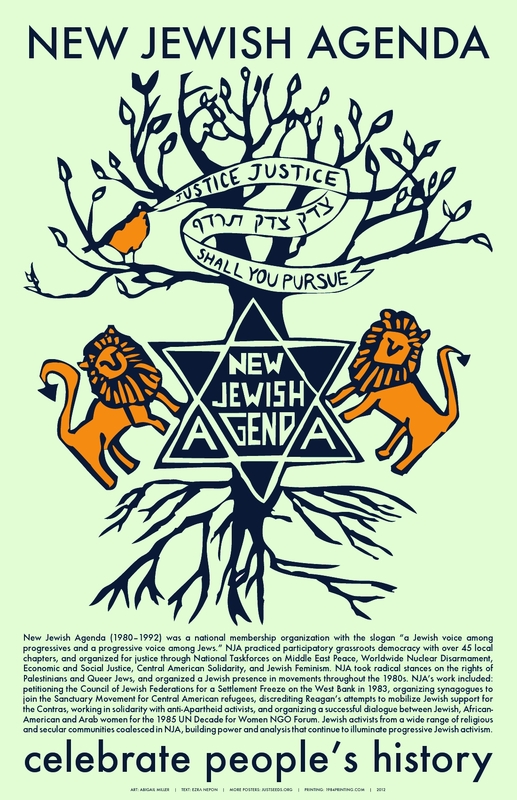 Justice, Justice Shall You Pursue: A History of New Jewish Agenda was published in 2012 by Thread Makes Blanket Press and is distributed by AK Press. The book by Ezra Berkley Nepon includes a history expanded from this website and two afterwords pieces: an essay by historian Rachel Mattson reflecting on why this history is so crucial, and an essay by JFREJ board member Daniel Rosza Lang/Levitsky reflecting on current Jewish activism in relation to NJA’s history. The book and poster feature original cover art by Abigail Miller. Celebrate People’s History Poster: $4 available at Justseeds Artists’ Cooperative!